A Body in a Station is Eiko's first solo performance with which her larger project A Body in Places started in 2014. 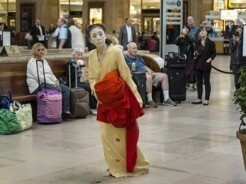 In the summer of 2015, Eiko will present the adopted work at the Fulton Street Subway Station in Lower Manhattan as a part of River to River Festival. 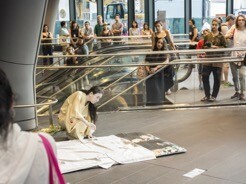 The premiere of the work was a series of three-hour performances at Philadelphia’s 30th Street Amtrak station on four consecutive Fridays in October 2014. The work was presented by Pennsylvania Academy of the Fine Arts (PAFA), this was the first solo work Eiko conceived and performed alone. Starting midday on October 3 and ending at midnight on Oct 24, the performance times will be staggered so there is precisely one week between the ending of one performance and the beginning of the next. Eiko and her collaborators examine how a performance affects and is affected by living everyday life between the “acts.” Mark McCloughan (dramaturge), Shakuhachi player Ralph Samuelson, and PAFA director Harry Philbrick worked closely with Eiko on the project. 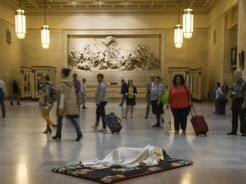 She has observed that, at the often-crowded 30th Street Station, most people are passing time and space alone. While a dance duet inevitably exhibits implicit drama between two explicit performers, by leaving that form—which she has explored in her decades as part of the performing duo Eiko & Koma—Eiko hopes to fully grapple with time, space, and people’s eyes/minds. A Body in a Station bears witness to human transformation. People traversing the space are literally and figuratively in transition from one state to another—from home to work, from high school to college, from loneliness to an encounter and sometimes the reverse. Many are rushing to and fro; many are waiting. Some have no other place to go. In the construct of a performance where viewers are not in darkness, rather walking by or gathering around the performer, observers are themselves being observed, by each other and by the lone Eiko. All performances are free and take place in the North Waiting Room. No reservation necessary. Opening on October 3, PAFA also showed a photo exhibition, A Body in Fukushima, a collaboration with photographer William Johnston. His photographs illuminate Eiko in abandoned train stations in Fukushima, Japan. Eiko hoped that seeing her body in photos as well as in performances would make people discover her body as a constant among very different stations and places. As such, her body became a conduit between Philadelphia and the radiation-devastated Fukushima as well as between the museum gallery and the 30th street train station. This project was created with the invaluable support from The University of the Arts where Eiko was in residency and taught a course Private Body /Public Places. Eiko’s activities in Philadelphia have been made possible by a Challenge Grant from the John S. and James L. Knight Foundation. 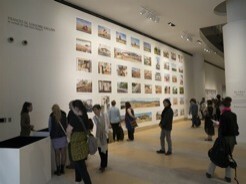 Creation of A Body in a Station and the associated photo exhibition, A Body in Fukushima, has also been supported by the Japan Foundation through the Performing Arts JAPAN program, by the National Dance Project of the New England Foundation for the Arts, by Doris Duke Performing Artist Fellowship, and by the National Endowment for the Arts.